The Tellico River is an Appalachian whitewater paradise. Waiting for the water to get high enough can be extremely frustrating, but when the winter and spring rains come, the Tellico becomes a beautiful torrent. If the level gets too high for your tastes, there are some great near-by alternatives. There are two main runs on the Tellico, with additional sections and tributaries. A road next to the river allows convenient scouting, and an easy out if things go wrong. The Ledges section is short and steep, dropping 220 feet over two miles of class IV rapids. The Middle Tellico is just over 5 miles long and gets easier as it goes, dropping 80 vertical feet in the first mile and decreasing to 32 feet/mile above the take out. The Ledges section starts at the first bridge crossing upstream of the Baby Falls parking lot and contains many class IV rapids at medium flows (400-600 cfs). Watch out when the water level gets above 800 cfs. Baby Falls, at 14 feet high, gets real nasty and so does the long Jerrod's Knee rapid. Run Baby Falls down the right or boof the curler on the left; either way you have to ski-jump it with speed and stay away from the middle. Don't celebrate too long or Diaper Wiper, just below, will wipe you out. Just below Baby Falls a wonderful tributary comes in at river left, announced by spectacular Bald River Falls. 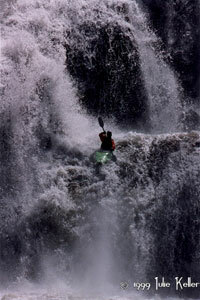 The last drop of this magnificent falls can be run by climbing up the river left bank of the falls and lowering boat and paddler on a rope into the eddy above the last drop. There is an alternate put-in about a mile below the Jerrod's Knee bridge at Turkey Creek. If you put in here you'll miss the best rapids of the middle section, including a nice ender spot called Bounce Off Boulder, or BOB for short. About a mile below Turkey Creek you'll find Fat Man's Squeeze, a long class III drop with an undercut ledge on the right bank that can be seen at low water. A little further down is Reeder's Rock, which is much more dangerous than it looks. Watch for the "Keep Right" sign on a tree growing out of the undercut rock. Make sure you stay away from it! If you are lucky enough to find the Tellico with too much water for the Ledges or Middle section, you have struck the gold mine! At levels between 1,000 and 2,000 cfs the section from Oosterneck to the Tellico Beach Drive-in is a great class III run. Above 2,000 cfs the long ledges at the bridge just above the Drive-In approach class IV levels. With more than 2,000 cfs in the Tellico, North River and Citico Creek are great class IV alternatives, both with gradients around 120 feet/mile. Above 2,000 cfs the upper-upper Tellico is a class III alternative. Put in at the picnic area with a small bridge across the river. Be sure to take out at the Ledges put in or you'll be in the soup. To get to the Tellico River, head east from Tellico Plains Tennessee on Highway 165. The road will follow the river. Just past Oosterneck Parking lot take the right fork onto Tellico River Road.